Wow this is our last post this year about Spring. Its been six weeks already? Its been so nice outside, and Ive been dying to plant my garden. 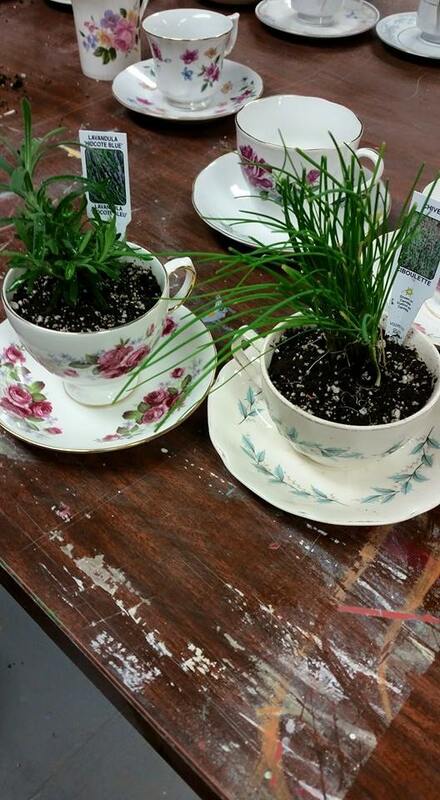 I have hosted 3 teacup garden classes, and I have fallen in love with simply having teacups all over my yard. 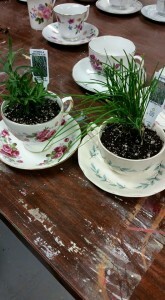 We planted not only in teacups, but gravy boats, and tea pots as well. Each looking unique and beautiful 🙂 We have another class set up for May 9th, that’s a Saturday from 1-2 pm. They are so simple and so far everyone has enjoyed doing it! The picture shown is one taken from our class. We were able to find a large variety of cups, boats, and pots to use. Not only did the ladies enjoy an afternoon out of the house, but we also had refreshments served. If you are having a wedding, bridal shower, baby shower, or even for Mothers Day. These make a delightful gift! Outside our flowers are starting to come alive. One of the best things that Spring offers my eyes is watching my plants pop up 🙂 Do you have limited space in your garden? There are so many creative ways to plant. 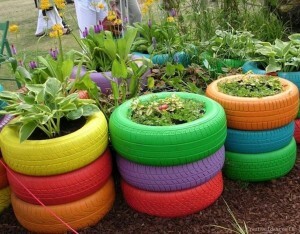 From teacups, to spare tires, to pallets if it has a hole in it you can plant in it! Pintrest has become my vise!!!! I love looking through it and getting ideas. I live in a small town home with a VERY small garden/patio space. I make due though and every year I have a beautiful garden. I love planting. I love flowers and herbs. And I love crafting… so clearly the next step for me is to create a garden that is creative, fun and unique… like me! Working at Home Re-Useables gives me a new outlook on items that I would not have thought about before. In our antique, and Re-Funk’d section we love to reuse items and give them new life. Using your old tires is a great and easy way to add color to your garden. 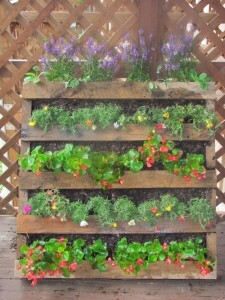 Simply paint them, stack them, fill them with soil, and add your favorite plants to them. They are great for potatoes, and plants that would normally need more room for their roots to grow properly 🙂 ** you can line the insides if you wish but stacking, and securing them together is fine. 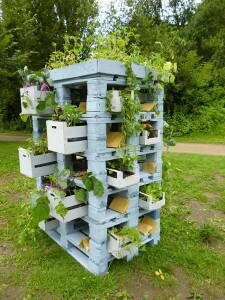 Ive seen many people use cinder blocks for gardening, you can stack them any way you want and plant in the holes! Teacups Ive talked about before, so I wont go into more detail again on them. 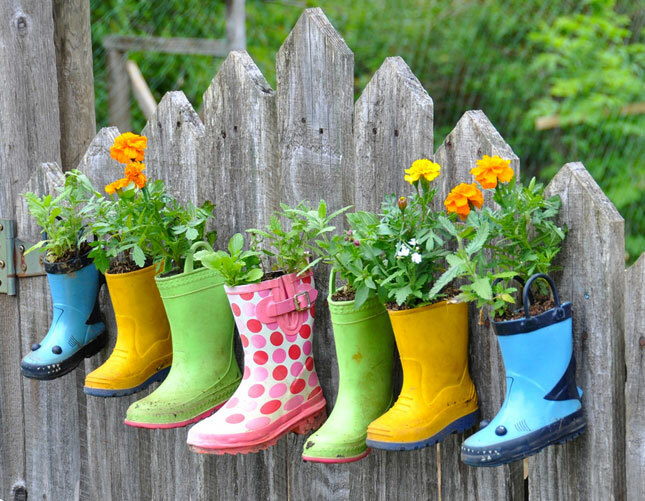 You can use paint cans, wheelbarrows, old bottles… and even rain boots. My daughter is very excited to have her own garden to take care of this year. 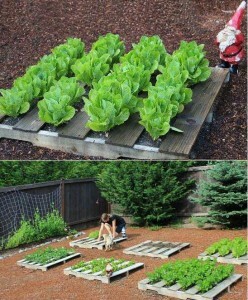 Children love getting hands on in the garden, and its a great learning experience for them as well as you. 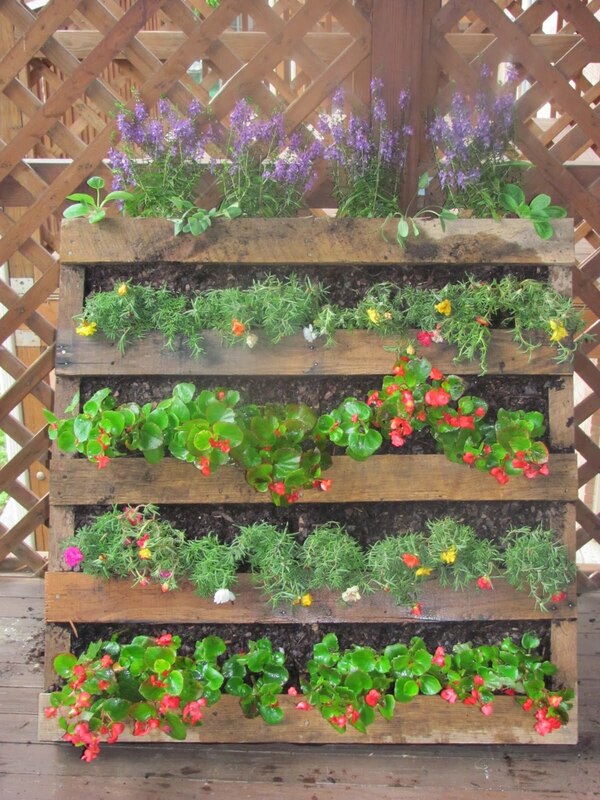 The last idea I’ll write about is pallets….. there are so many ideas to use them for. Its inexpensive, you recycle, and you can do so much with them. Where ever I turn I seem to find pallets being thrown in the trash. Look! A FREE planter! Mount it on your wall or fence, stack them on top of each other. Or even use them indoors as a mounted shelving unit. You can easily keep your carrots away from your beets, and you can keep your mint from going wild and spreading all over your garden! 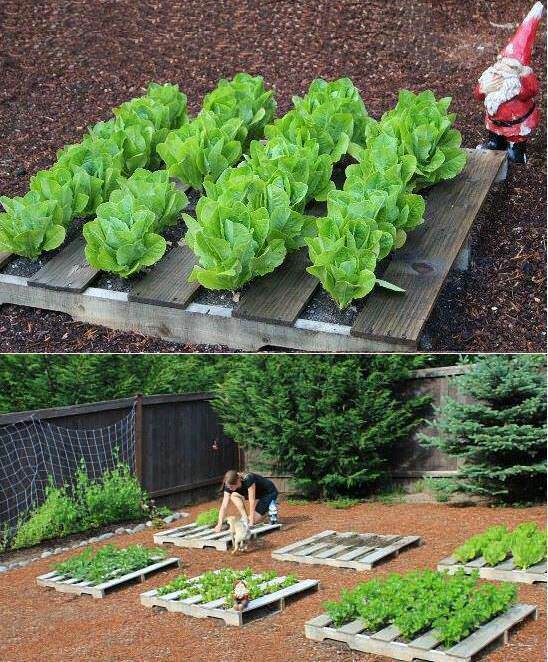 Growing lettuce, and other vegetables are a breeze with pallets. They keep everything properly separated, and they create nice lines. Thank you to who ever is reading my posts. Im going to continue writing them, hopefully every week. Im going to put more of a focus into renovations, and things we are doing here at the store. 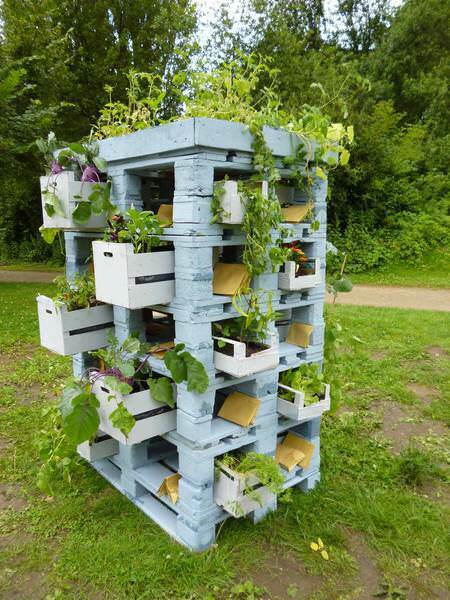 Its been fun writing about gardening, but now that Ive completed my 6 weeks of gardening inspiration I can go on to showing how Home Re-Useables can help you with your home and outdoor renovations. Stay tuned for our next post…… not to sure yet what I will write about but it will be something to do with home reno’s! Have a great one and feel free to stop by and check out our store! !